HadCRUT4 is a global temperature dataset, providing gridded temperature anomalies across the world as well as averages for the hemispheres and the globe as a whole. CRUTEM4 and HadSST3 are the land and ocean components of this overall dataset, respectively. These datasets have been developed by the Climatic Research Unit (University of East Anglia) in conjunction with the Hadley Centre (UK Met Office), apart from the sea surface temperature (SST) dataset which was developed solely by the Hadley Centre. These datasets will be updated at roughly monthly intervals into the future. Hemispheric and global averages as monthly and annual values are available as separate files. CRU gratefully acknowledges the long-term support for developing, improving and updating these datasets provided by the US Department of Energy (1984-2014, grant DE-SC0005689) and by the UK National Centre for Atmospheric Science (NCAS) (2016-present), a NERC collaborative centre. Additional short-term support is also acknowledged (the 2016 and 2017 updates, to CRUTEM4.5 and CRUTEM4.6 were partially supported by NERC through the SMURPHS project, grant NE/N006348/1). Absolute temperatures for the base period 1961-90 on a 5° by 5° grid (Jones et al., 1999). Note that in this file, latitudes run from North to South. Correction issued 30 March 2016. The HadSST3 NH and SH files have been replaced. The temperature anomalies were correct but the values for the percent coverage of the hemispheres were previously incorrect. The global-mean file was correct, as were all the HadCRUT4 and CRUTEM4 files. If you downloaded the HadSST3 NH or SH files before 30 March 2016, please download them again. The gridded data available here are in netCDF format, which is widely supported by open-source software such as R, Panoply and commercial packages such as Matlab, IDL. The CRUTEM4 data are also available via our Google Earth interface. Text (ASCII) format files are also available at the Hadley Centre download data pages (follow the links in the table above). Timeseries of global and hemispheric mean temperature anomalies as well as maps of the current year's data are available here. Also see Tim Osborn's take on Ed Hawkin's famous temperature spiral. For graphs (and data) of individual land grid cells or individual weather stations, use our CRUTEM Google Earth interface. HadCRUT4 and CRUTEM4 datasets are available for further online analysis at the KNMI Climate Explorer. Jones, P.D., Lister, D.H., Osborn, T.J., Harpham, C., Salmon, M. and Morice, C.P., 2012: Hemispheric and large-scale land surface air temperature variations: an extensive revision and an update to 2010. Journal of Geophysical Research 117, D05127, doi:10.1029/2011JD017139. The answers given are intended to be brief rather than comprehensive. For complete details readers are referred to the scientific references already given. What is the updating schedule? 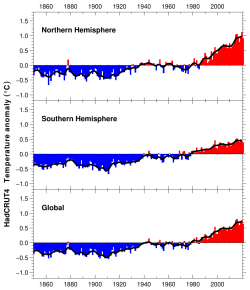 How are the hemispheric and global anomaly series calculated? What are the basic raw data used? Why are sea surface temperatures rather than air temperatures used over the oceans? Why do anomalies not average exactly zero over 1961-90? How are the land and marine data combined? How accurate are the hemispheric and global averages? Why can I not exactly reproduce the hemispheric and global averages for HadCRUT4 and HadSST3 that are given here? Why are values slightly different when I download an updated file a year later? All the grid-related files on this page (except Absolute) are updated on a monthly basis to include the latest month within about four weeks of its completion. Updating includes not just data for the last month but the addition of any late reports for up to approximately the last two years. Every year, we also add in updated data for stations that do not report in real time, by using station data that we access from National Meteorological Services (NMSs) around the world. This annual update take places around May or June each year, as by then sufficient NMSs should have made their monthly average data available for the preceding year. Where available, we add in extra data from some NMSs when they make more homogeneous data available. The routine annual updates include data from the USA, Canada, Russia, Australia and a number of European countries. When this annual update is complete, we also update the station data. Values for the hemisphere are the weighted average of all the non-missing, grid-box anomalies in each hemisphere. The weights used are the cosines of the central latitudes of each grid box. The global average for CRUTEM4 and CRUTEM4v is a weighted average of the Northern Hemisphere (NH) and Southern Hemisphere (SH). The weights are 2 for the NH and one for the SH. See Osborn and Jones (2014) for how this differs from previous versions of CRUTEM. For HadCRUT4, the global average is the unweighted average of the NH and SH values. In the timeseries files, the second row of integers is the percentage of the surface area covered for each month from 1850. In the CRUTEM4 timeseries graphs above, we only show the SH and global averages from 1856 onwards because the land data coverage in the SH is poor before 1856. For land regions of the world over 4800 monthly station temperature time series are used. Coverage is denser over the more populated parts of the world, particularly, the United States, southern Canada, Europe and Japan. Coverage is sparsest over the interior of the South American and African continents and over Antarctica. The number of available stations was small during the 1850s, but increases to over 4500 stations during the 1951-2010 period. For marine regions, sea surface temperature (SST) measurements taken on board merchant and some naval vessels are used. As the majority come from the voluntary observing fleet, coverage is reduced away from the main shipping lanes and is minimal over the Southern Oceans. Improvements in coverage occur after 1980 through the deployment of fixed and drifting buoys. The development of the datasets is extensively discussed in Jones et al. (2012) and Kennedy et al. (2011). Both these sources also discuss the consistency and homogeneity of the measurements through time and the steps that have been made to remove non-climatic inhomogeneities. Raw station data used to produce CRUTEM4 are available from the Met Office website (CRUTEM4) and the station data (and graphs) are also available via our Google Earth interface. Over the ocean areas the most plentiful and most consistent measurements of temperature have been taken of the sea surface. Marine air temperatures (MAT) are also measured and would, ideally, be preferable when combining with land air temperatures, but they involve more complex problems with homogeneity than SSTs (Kennedy et al., 2011). The problems are reduced using only night marine air temperature (NMAT) but at the expense of discarding approximately half the MAT data. Our use of SST anomalies implies that we are tacitly assuming that the anomalies of SST are in agreement with those of MAT. Kennedy et al. 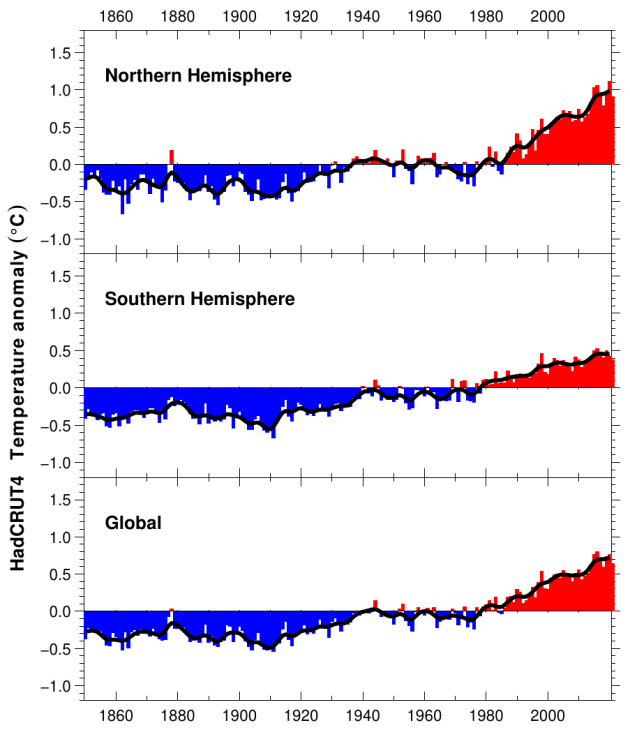 (2011) provide comparisons of hemispheric and large area averages of SST and NMAT anomalies. Stations on land are at different elevations, and different countries measure average monthly temperatures using different methods and formulae. To avoid biases that could result from these problems, monthly average temperatures are reduced to anomalies from the period with best coverage (1961-90). For stations to be used, an estimate of the base period average must be calculated. Because many stations do not have complete records for the 1961-90 period several methods have been developed to estimate 1961-90 averages from neighbouring records or using other sources of data (see more discussion on this and related points in Jones et al., 2012). Over the oceans, where observations are generally made from mobile platforms, it is impossible to assemble long series of actual temperatures for fixed points. However it is possible to interpolate historical data to create spatially complete reference climatologies (averages for 1961-90) so that individual observations can be compared with a local normal for the given day of the year (more discussion in Kennedy et al., 2011). It is possible to obtain an absolute temperature series for any area selected, using data from the absolute file, and then add this to a regional average of anomalies calculated from the gridded data. If for example a regional average is required, users should calculate a regional average time series in anomalies, then average the absolute file for the same region, and lastly add the average derived to each of the values in the time series. Do NOT add the absolute values to every grid box in each monthly field and then calculate large-scale averages. Over both the land and marine domains considerable care has been taken in calculating the base period values for the 1961-90 period (see Jones et al., 2012). However, as all regions don't have complete data for this 30-year period, the anomaly data do not average exactly to zero for this 30-year period. This applies to the global and hemispheric average series as well as the individual grid-box series. Both the component parts (land and marine) are separately averaged into the same 5°x5° latitude/longitude grid boxes. The combined version (HadCRUT4 ) takes values from each component and weights the grid boxes according to the area, ensuring that the land component has a weight of at least 25% for any grid box containing some land data. The weighting method is described in Morice et al. (2012). Uncertainty estimates are supplied with the same data given at the Met Office site: CRUTEM4, HadCRUT4. Both these are ensemble datasets. This means that there are 100 realizations of each in order to sample the possible assumptions involved in the structure of the various components of the error (see discussion in Morice et al., 2012). All 100 realizations are available at the above Hadley Centre site, but we have selected here the ensemble median. For the gridded data this is the ensemble median calculated separately for each grid box for each time step from the 100 members. For the hemispheric and global averages this is again the median of the 100 realizations. The median of the gridded series will not produce the median of the hemispheric and global averages, but the differences will be small. All the files on this page (except Absolute) are updated on a monthly basis to include the latest month within about four weeks of its completion. Updating includes not just data for the last month but the addition of any late reports for up to approximately the last two years. Every year, we also add in updated data for stations that do not report in real time, by using station data that we access from NMSs around the world. This addition takes place around May or Junes each year, as by then sufficient NMSs will have made their monthly average data available for the preceding year. Where available, we add in extra data from some NMSs when they make more homogeneous data available. The routine annual updates include data from the USA, Canada, Russia, Australia and a number of European countries. In addition to this the method of variance adjustment (used for CRUTEM4v) works on the anomalous temperatures relative to the underlying trend on an approximate 30-year timescale. With the addition of subsequent years, the underlying trend will alter slightly, changing the variance-adjusted values. Effects will be greatest on the last year of the record, but an influence can be evident for the last three to four years. Full details of the variance adjustment procedure are given in Jones et al. (2001). Farmer et al. 1989, "Documenting and explaining recent global-mean temperature changes" - final report to NERC contract GR3/6565.